Portal is a full screen wordpress portfolio template with tons of options for displaying your work and prepared over 15 layouts for displaying your content in the perfect way. Portal portfolio template has logo portfolio, architecture portfolio, web design portfolio, product portfolio, illustrations portfolio and software portfolio ready for you to insert your content. Horizontal Scroll gallery and portfolio sections make this template unique on the market. It is perfect for presenting your work in a full screen environment. The blog section of the portal – wordpress portfolio template is presented in a creative way. The posts in the blog can be displayed in 6 different layouts. Overall this template is perfect for a creative agency portfolio or an individual looking to display his work in a creative way. We have prepared 5 different layouts for the blog post. You can set the image on top with or without title or place it on the side of the post or insert some video. Creative and functional portfolio page lets you showcase your work with style. Gallery page, with the parallax title, is a creative way to present your photography portfolio. 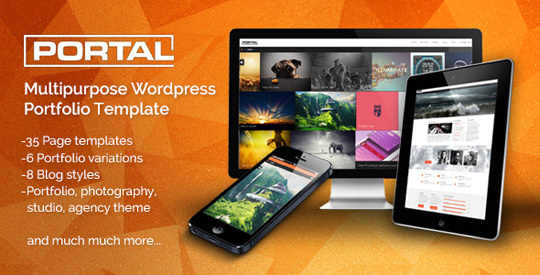 In order for you to set up your template fast we have prepared multiple layouts. Simply load them using the Frontend Builder for WordPress and replace the content with your own. The main menu on the top is always full screen. Even if you place 2 menu links. The width of the menu link is calculated using the width of the display that you are using to view Portal – wordpress portfolio. Portal – wordpress portfolio template is fully responsive with some carefully thought out solutions for elements and their responsive versions. All drag-able elements on the template behave the same on all screens and resolutions. We have included 4 different sets of social icons ranging from “flat long shadow” icons to simple colored ones. All of the major social networks are covered. The documentation that goes with Portal – wordpress portfolio template is written for a regular user and can be a lot of help while you discover endless possibilities of the theme. We understand that some first time users may have difficulties with the installation process, that is why we offer our assistance with the template installation after the purchase. Our support team is always here to help you out. We will tackle all the obstacles in order for you to have a template that you have always wanted.